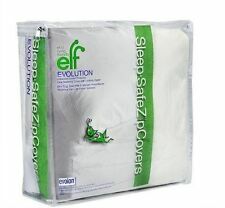 Sleep Safe EVOLON Bed Bug Allergy Mattress Encasement Zip Cover - Long Twin 9"
WHATS INCLUDED: TWIN XL MATTRESS PROTECTOR. WE WILL WORK TO RESOLVE ANY ISSUES YOU HAVE. Top only!! Designed to zip on top of the base that you currently have. Designed to fit all mattress collections by Tempur-pedic. Temperpedic Tempur-protect Twin Xl Open Box. Condition is New with tags. Shipped with USPS Priority Mail. Sleep Safe EVOLON Bed Bug Allergy Mattress Encasement Zip Cover - Long Twin 12"
Washing only makes it softer and will not remove its efficacy after repeated washings up to 200 degrees Fahrenheit. This is the best high tech protection against bed bugs, dust mites, allergens and works so well you will not know it is there. Equip Your Space® Foam Mattress Topper. Get a luxurious night's sleep with the Equip Your Space Twin/TwinXL Foam Topper. Cradles every part of the body to help relieve pressure points. Made in USA of U.S. and imported materials. Give your mattress an extra layer to prevent spills, dirt, allergens & more from getting through the surface with the Basic Waterproof Fitted Sheet Style Twin Extra Long Mattress Protector from Protect-A-Bed®. Lie down, breathe deeply and sleep well. Raise your comfort level with Mainstays 5 Zone 1.25" Hypoallergenic Mattress Topper. This polyurethane mattress pad provides exceptional support for a more relaxing night's sleep. And it's easy to clean, too.